A recipe from a recent Hugh Fearnley-Whittingstall bean recipe round-up – as he says, ‘summer is a time when all of us can be full of beans’. If you’ve got more than you can cope with in your box, why not freeze some for winter use? This simple, tasty salad works with runner beans, too. Top and tail the beans. Bring a pan of salted water to the boil and cook the beans until just tender, about three to six minutes, then drain and refresh in cold water. Dress the beans in the olive oil, lemon juice, mint, some of the dill, salt and pepper. 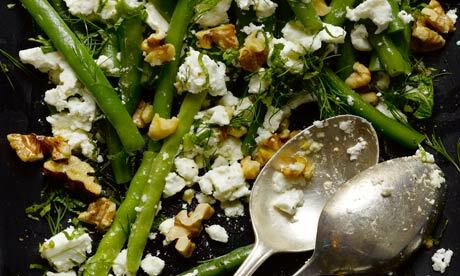 Serve topped with crumbled feta cheese, walnuts and the remaining dill fronds scattered over the top.